Sometimes a simple keyword search is not enough. The Advanced Search function allows you to be even more specific with your search to get improved results. You can look for specific terms within a field or choose other parameters that can make your results more accurate. First perform your initial search, then open the Refine panel and look for Advanced Search drop down. Click Advanced Search and then select which areas you would like to refine you results. The Image Relay search default is set to Find Files That Include All Words. This means that it is search is looking for files that include those words, but not necessarily in the order you have entered them. If you choose Find Files That Include Any Words, your results will bring back any files that include one or all of your search terms. This search method is the most broad. 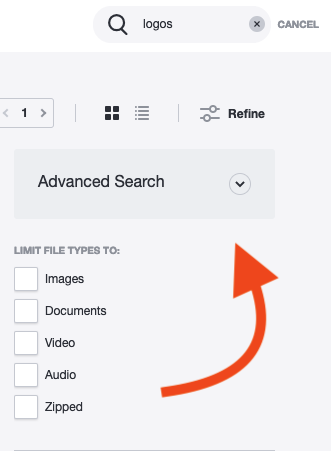 You can also choose Find Files That Include Exact Words, which will bring back results that have your search terms in that exact order somewhere in the file. This search method is the most narrow. You can also choose a specific folder to search within, which can be extremely helpful in narrowing your search.